Intv Brotherhood Members | Welcome to the Intellivision Revolution! 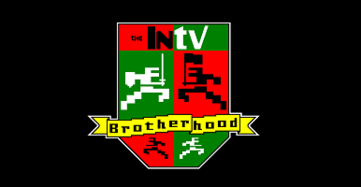 The Intv Brotherhood is a small but dedicated group of Intellivision players, fans, collectors, enthusiasts. Their love for the Intellivision is second to none. Join a group that shares your passion and love for the greatest system ever made, the Mattel Intellivision! Members may also want to display their Intv Brotherhood membership status in various forums and other sites by stating that they are a member in their 'signature' and linking to this Intv Brotherhood member area. Members and Non-Members of The Intv Brotherhood are encouraged to submit pictures if you qualify for the exclusive 125 Club. Also PLEASE submit your Intellivision console and accessories to the Serial Number Database. A popular place for some members to congregate is the Atari Age forums. Don't forget to join the official IntellivisionRevolution Newsletter as well for info on new Intellivision releases. Over 150 members and counting!